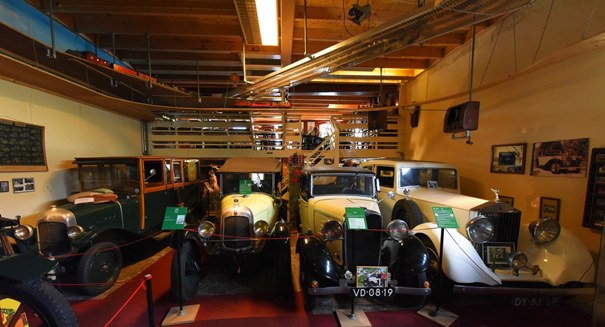 The museum has a large collection of pre-war cars. We have oldtimers from several big European brands such as Peugeot, Renault and Citroën. Apart from those we also have some less known brands. For example, have you ever heard of Singer, MG or DKW? Finally we have several American oldtimers from Ford and Chrysler. Our collection will show you the roots of the early history of automobiles in a beautiful fashion. Through stories we will introduce you with this history. We will tell you about a bitter rivalry between a French and a Dutch car manufacturer, the first car accident with fatal consequences in the Netherlands, the first Bond car, the success story of Henry Ford and many more. Of course we will also be able to tell you about all the technical details. Learn how early car manufacturers were able to use clever designs and technical innovations to lower taxation on their cars. Or how the discussion on traffic safety led to new developments. Some examples are the change from oil lighting to carbide and eventually to the first car with electric lighting or technical innovations in traction that led to the first car with front-wheel- drive. The above mentioned details only give away a small glimpse of what you can expect from our oldtimers. You hope you will visit us to explore the rest of our unique collection!